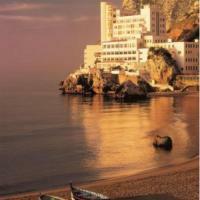 On the tranquil Eastern side of the Rock, this 4-star Gibraltar hotel boasts stunning views of the Mediterranean Sea. It has a restaurant, a grill with open-air dining and a health and beauty club. Recognized by the World Travel Award Organisation as Gibraltar's Leading Hotel in 2009 and 2010, The Caleta Hotel Health, Beauty & Conference Center offers bright, air conditioned rooms each featuring an LCD satellite TV and a minibar. Some rooms have views of the Costa del Sol coastline. The award-winning Nuno’s Restaurant specializes in homemade pastas and seafood, while The Garden Grill boasts a lovely courtyard setting. There is a lively lounge bar at the center of the hotel. Guests at the Caleta Hotel’s can relax with one of a range of massages and beauty therapies. There is also a modern gym and a hair salon. The vibrant town center on the west side of the peninsular is just a 10 minute drive away. Gibraltar’s airport is a 5 minute car ride away. With wonderful views across the Mediterranean Sea, The Caleta Hotel offers award-winning food and a modern leisure centre. The hotel is on the tranquil eastern side of the Rock of Gibraltar. Each of the stylish apartments has a modern bathroom and a fully equipped kitchen. All apartments have air conditioning, and a living area with flat-screen TV, DVD player and private balcony. Guests can enjoy homemade Italian cuisine in Nuno’s Restaurant. In summer months, the hotel offers alfresco dining on Nunos Terrace, just a few metres above water level and with spectacular views across North Africa and the Iberian Peninsula. The Caleta Hotel Self-Catering Apartments complex has a swimming pool with sea-view sun terraces. There is also an air-conditioned fitness centre and a hair and beauty salon, and free Wi-Fi is accessible. Caleta Self-Catering Apartments are just 10 minutes’ drive from Gibraltar town. The vibrant Western Bay and picturesque harbour are just 3 km away, and there is free on-site parking. The Alameda Botanical Gardens and Gibraltar’s cable car are both less than 100 metres from the Queen’s Hotel. Some rooms at the Queen's have a balcony which offers views across the Mediterranean Sea. Breakfast is served in the hotel's restaurant which has panoramic views across Gibraltar Rock. The spacious bar and lounge area features wooden beamed ceilings and traditional brick archways. 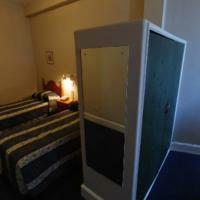 All rooms have air-conditioning and private bathrooms with a hairdryer and a selection of toiletries. Main Street is less than 100 metres from the hotel, and the famous Trafalgar Cemetery is a 50-metre stroll. The Airport of Gibraltar is a 5-minute drive away. This magnificent landmark hotel is situated on the Rock of Gibraltar, and has stunning views. Built in 1932, it is decorated in a colonial style, and its famous past guests include Sir Winston Churchill. Rooms at Rock Hotel come with satellite TV and facilities for making tea and coffee. Each also has its own bathroom, and a balcony with views of the sea. The hotel’s restaurant also has panoramic views across the Bay of Gibraltar, the Spanish mainland and the Rif Mountains of Morocco. It serves British Cuisine with an African influence, and offers fresh local seafood. Guests can enjoy an open-air seawater pool, which sits in its own secluded garden. There is also a health and beauty centre, as well as a free-to-use and well-equipped gym. The town centre is just 1 km from Rock Hotel, with a shopping centre within 2 km. There are botanical gardens to visit just 100 metres from the building.